New original painting offered with a beautiful gold frame. Inspiration for this painting is from the beautiful shoreline along Long Island Sound in Connecticut. There are still some undeveloped areas where the beaches are untouched. This is an original acrylic painting 20 inch by 20 inch with a overall size of 26 inches with the frame. 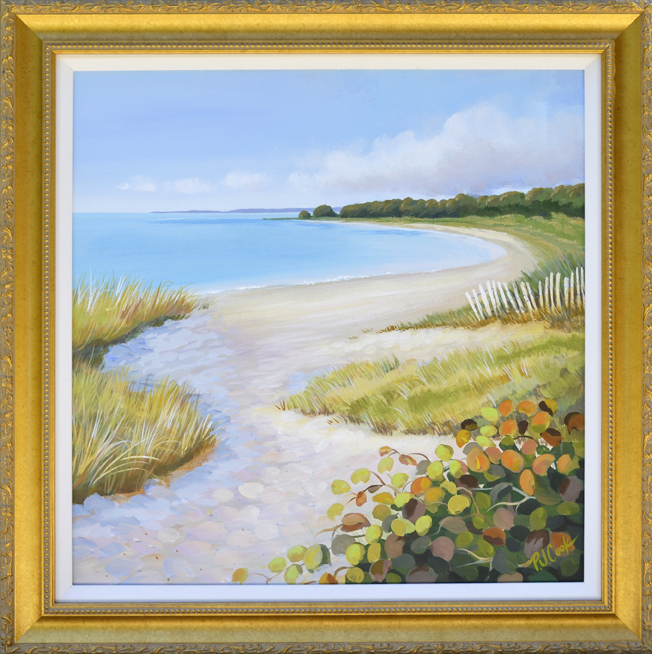 Painting can be viewed and purchased at Aritsans Harbor, 188 Main St. in Old Saybrook, CT. Wed – Sat from noon to 5pm and Sundays 10:30- 2pm. New Watercolor Lessons starting this Wednesday May 16, 2012 from 2:30 – 4:30. Watercolor classes are held at Artisans Harbor, in Saybrook, CT. All levels of artists are welcome. There will be 6 classes held once a week on Wednesdays. Various techniques, tips and tricks will be taught as the students follow along as I demonstrate a new technique each week.